A new property development is being planned within the city. The planning department has asked for a 3D visualization of the city elevation model, taking this new development into account. The task is to read the current elevation model, apply changes provided by the property developer, and create a three-dimensional output in Adobe PDF format. Your manager has handed you this task, thinking that it will be very difficult. He doesn&apos;t know FME as well as you do! 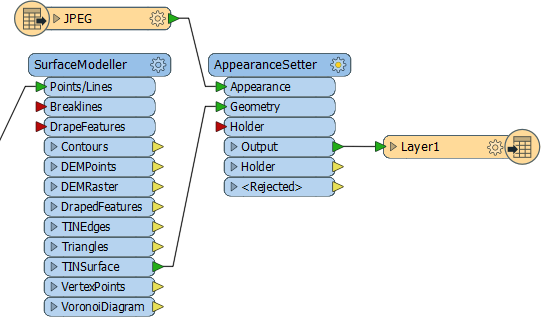 Feel free to use the FME Data Inspector to inspect these source files. This is a HUGE shortcut here. It has added a single feature type and set a merge filter to read ALL data. In this scenario it makes the workspace way tidier and easy to use than if each file had its own feature type. Of course, this only works where all of the source files have the same attribute schema (like here) and we are sure that we want to read all of the source layers (we do). Now let&apos;s add the developer&apos;s data. Again select Readers > Add Reader from the menubar. The other thing we should do is set the workflow option back to Individual Feature Types, in case there is data other than contours in there. Now click OK. 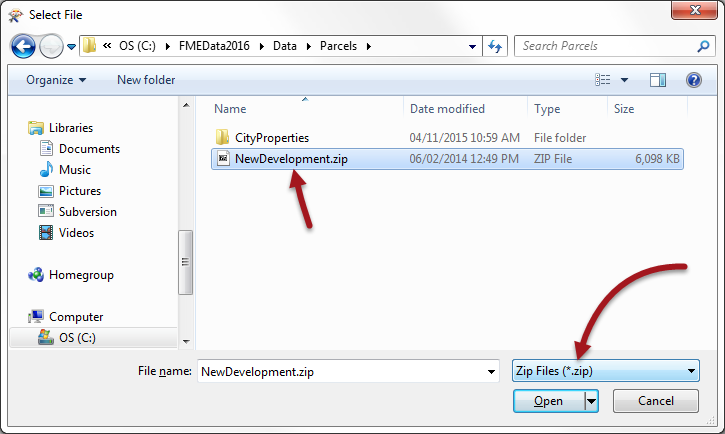 When prompted for which feature types you want from the zip file, select NewContours only. The ChangeDetector transformer will tell us which contours are new in this dataset, which are replacements, and which are the same as before. So, place a ChangeDetector transformer and connect it in. The original contours should be connected to the Original port(!) and the revised contours to the Revised port. You can check the parameters, but none should need changing. We can check in 2D because the contours are 2D with an elevation attribute. Add Inspector transformers to the output ports of the ChangeDetector and run the workspace to see what we have got so far. The Unexpected Input Remover might appear, but you know this isn&apos;t a problem, right? We deliberately chose not to read the BuildingFootprint or Labels from the source data. You should find 3,967 contours were unchanged; i.e. they were in the original data and the new version. Seven (7) contours have been added; i.e. they appear in the new data but not the original version. Three (3) contours have been deleted; i.e. they appear in the original data but not in the new data. Did you notice that the Added contours do not have an elevation value set? This is a problem because we can&apos;t generate a proper 3D model without elevation! It must be that the labels in the source data are meant to denote the contour elevation (you can use the Data Inspector to open the data and confirm this is so). Therefore we need to add that data to the workspace. We already have a Reader so you just need to add the Feature Type. Click OK and now you should get a new feature type. Because we&apos;re reading from a zip file we don&apos;t even need to change the dataset parameter; FME will pick up the data anyway. Open the parameters dialog and set the Maximum Distance parameter. This defines the maximum distance from the contour to the label. Because the labels appear to be almost on top of the contour you can set this to a low number, for example 5. Now add some more Inspectors and rerun the workspace to ensure all seven contour features have an elevation value now. 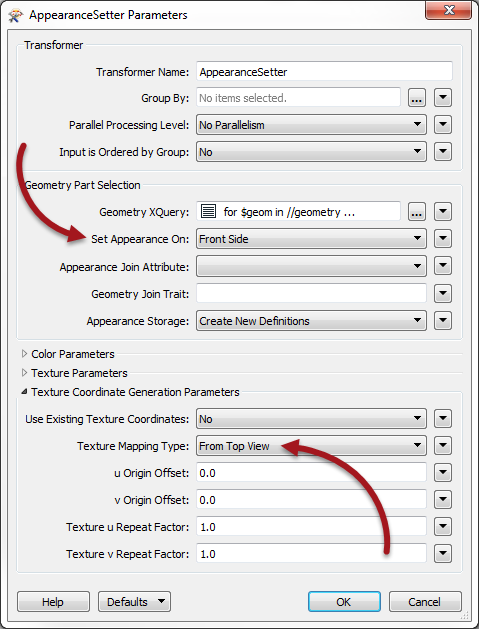 Having an elevation attribute is fine, but to actually create a 3D model we must convert this into a true Z value. This is done with a 3DForcer transformer, so place one of these. 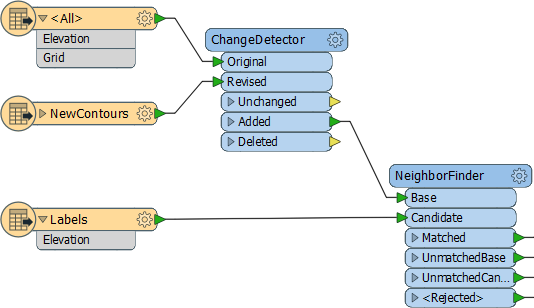 The ChangeDetector:Unchanged and NeighborFinder:Matched are the features we need to process. Now open the parameters dialog. 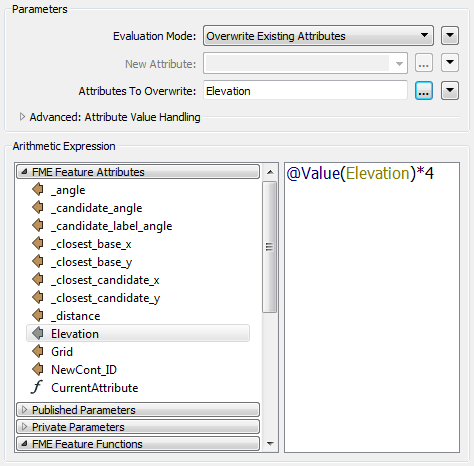 For Elevation, click the drop-down arrow and choose Attribute Value > Elevation. Now we have 3D contours we can create a surface model. 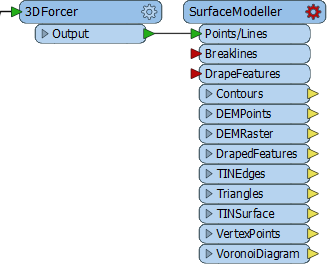 Add a SurfaceModeller transformer connected to the 3DForcer output. The input port to connect is Points/Lines. Open the parameters dialog. Set a Surface Tolerance of 1, and turn off the checkbox for Output Contours (it will run faster without). If you now connect an Inspector to the TINSurface output port and run the workspace, you will be able to inspect the data in 3D. 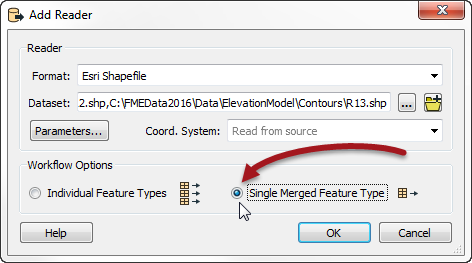 To rotate the data in 3D in the FME Data Inspector, click the orbit icon on the toolbar, or press down on the centre mouse button if you have one. If Vancouver seems a little flat, then why not exaggerate the Z scale a little to compensate! Make sure you choose the 3D (not 2D) version of the PDF Writer. You can choose to add a new feature type for the output in whatever way you want. The best method will be to select either Manual or Automatic from the Add Writer dialog. Give the feature type a name such as Surface and connect it up to the SurfaceModeller:TINSurface port. Now run the translation. Locate the output data - it will take a minute or so to write - and open it in Adobe Reader. You&apos;ve now used Readers and Writers (and transformers) to update an elevation model and create a 3D rendering of it. But there is so much more we can do with this. As an advanced task let&apos;s drape a raster image onto the surface model to make it look prettier. Open the parameters dialog. Change "Set Appearance On" to be Front Side. Run the workspace (be sure to close the PDF first if it is open in Adobe Reader). This time the PDF output should have a raster image draped on it. By default the PDF output will now be close to 100mb in size. If this is too large for your computer to handle, add a RasterResampler transformer before the JPEG feature type and set the parameters to resample to 25% of the original. 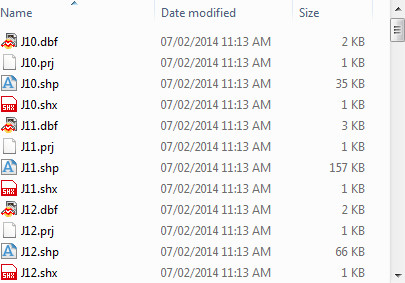 The PDF will now only be 8mb in size, but the quality will, of course, be much less. In the previous output, did you spot the lump in the surface where the new property is going to be developed? The one last thing we could do is add the building outline so that we can see where it will go. 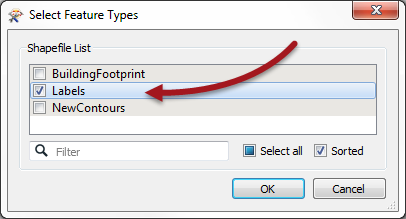 Because we don&apos;t have the building data in the workspace the first task is to use Import Feature Types to add that back to the NewDevelopment Shapefile Reader. Connect that up to the SurfaceModeller:DrapeFeatures input port (i.e. we want to drape the building onto the 3D surface that is being generated). Add an Extruder transformer, connected to the SurfaceModeller:DrapedFeatures output port. Set the Extruder parameters to extrude the data by a height of 25. This will create a 25m high building. Wow! Even allowing for the 4x scale increase on the DEM, this building is very prominent on the Vancouver skyline!